A rocking concert, an impassioned speech in Arabic and memories of the first modern Passover in Hebron. Approximately thirty thousand people participated in the annual Passover music festival in Hebron held in front of the Tomb of Machpela, burial site of the Biblical Matriarchs and Patriarchs on Monday, April 25, 2016. This year's event was held in honor of the upcoming 50th anniversary of the liberation of Hebron during the dramatic Six Day War of 1967. Veterans of those heady days in the late 1960s as well as elected officials spoke at the special ceremony. Rabbi David Lau, Ashkenazic Chief Rabbi and son of former Chief Rabbi and Holocaust survivor Rabbi Yisrael Meir Lau stated, "This large and holy crowd has gathered here to begin the jubilee celebrations of the liberation of Judea and Samaria... We have come here to mark 50 years from when we returned, and this time it is a full return because we will never have to stand at the "seventh step" in order to pray with Mother and Father. As we have merited this, may we merit to have full return and to settle the nation of Israel in its land." He also quoted the prophet Jeremiah (31:15) saying, "restrain your voice from weeping... thy sons have returned to their borders." Rabbi Lau referred to the infamous seventh step of the staircase that once led into the Tomb of Machpela complex. For about 700 years, Ottoman officials forbade Jewish residents from entering beyond this point. Rabbi Haim Druckman, a founder of the Gush Emunim movement in the 1960s, and an Israel Prize laureate reminisced about the first days of the return to the city. "I was privileged to attend the first modern seder in Hebron. In the morning when we went from the edge of the Cave of the Patriarchs, we were singing and dancing with a Torah in our arms. We were initially afraid to ride by Arab run public transportation, but there was no other bus. There were white flags of surrender in all the windows of the city. What changed? We started talking about the land itself. We went back to the forefathers. We returned to the matriarchs. We went back to where it all began. It was clear to everyone that we're back. And all of reality was different. Hebron is the foundation of all the renewed communities in Judea and Samaria... I can not promise you peace. I can only promise I will do everything in my power to stand up our historical rights for the sake of all citizens of the entire country." Deputy Minister of Regional Cooperation Ayoub Kara, an Israeli of Druze ethnicity celebrated both Passover and the Druze holiday commemorating the Biblical prophet Jethro, whom they call Nabi Shu'ayb. Minister Kara praised the Jewish community of Hebron stating, "without you, the rest of us wouldn't be able to visit here today. You strengthen the security of Israel. We will continue together to protect the State of Israel for generations." Minister Kara also spoke in Arabic and addressed the Arab resident of the city who fall under the jurisdiction of the Palestinian Authority. "Israel is a democracy," Minister Kara stated. "The Palestinian Authority does not offer you any salvation. We are all in this together, and we can learn to live in peace. Only under Israeli sovereignty will your rights and your lives be insured. Without Israel there is ISIS." Deputy Defense Minister Eli Ben-Dahan echoed the growing sentiment in the Israeli public for sovereignty stating, "today, after 50 years, we need to move up another level. We have been liberated from the yoke of foreigners, but now we must connect Judea and Samaria to the rest of Israel and establish sovereignty over all the areas, starting right here with Hebron." Members of Knesset from a variety of different political parties including MK Bezalel Smotrich, MK Shuli Mualem-Rafaeli, MK Nissan Slomiansky, MK Moti Yogev and others. Hebron residents who spoke included CEO of the Jewish Community of Hebron Uri Karzen, and spokesperson Noam Arnon. Other speakers included the CEO of the Council of Judea and Samaria Sheila Adler and Rabbi Menachem Felix who led the effort to repatriate Judea and Samaria in the 1970s. Following the jubilee ceremony was the annual music concert. 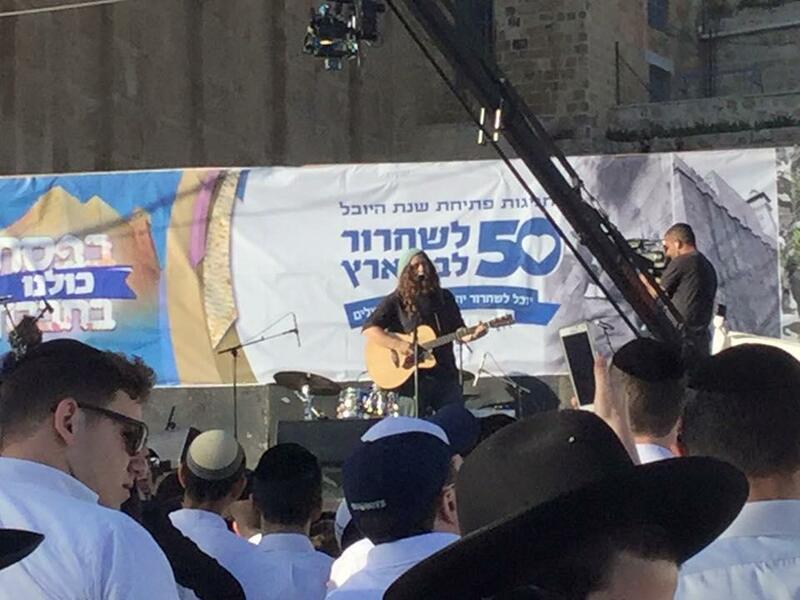 Performers included Haim Israel, Itzik Dadya, Udi Davidi, Bini Landau, Uziah Tzadok, Gershon Freishtat, Pirchei Yerushalayim, and more. A highlight for many of the thousands of visitors was the rare ability to walk through the hall of Rebecca and Isaac, the largest room on the Tomb of Machpela complex and location of the entrance to the actual underground double caves. The hall is closed for Jews most of the year except for ten days. The smaller Jewish side of the complex is closed for Muslims expect for ten days corresponding to Muslim holidays. Also open for visitors was the Cave of Othniel Ben Knaz, the first judge of Israel who took over leadership after the passing of Joshua, located about 200 meters west of Beit Hadassah, at the top of a rocky incline. The burial cave is located in what is today known toward as Policeman's Square on a busy residential street. The carved out compartments in the sides of the cave correspond with how the Mishna, in Bava Batra 101 describes the traditional burial practices of the Jewish people of that time period. Throughout the generations, it has been revered as the tomb of Othniel Ben Knaz, brother (kinsman) of Caleb and has been mentioned by many historic travelers such as Menachem Mendel of Kamenitz and J. J. Benjamin. On the day of the festival, hundreds walked to the cave, which before the 1929 massacre, was part of the thriving Jewish neighborhood of the city. The local Judea Brigade Commander who helped arrange the visit was quoted by Israel National News as stating, "For me personally, it was inspiring to see the hundreds of visitors, citizens together with tourists from abroad, on a secure trip to the tomb of Othniel ben Kenaz. We are proud to have escorted this visit." Special tours to the old Jewish Quarter including the "Kabbalist's Corner" were held. Today the area is a busy casbah, and is usually off limits to Israeli civilians. Other highlights included tours of the new archaeological excavations near the Tomb of Ruth and Jesse which includes ancient olive presses and mikvot [ritual baths] and the new state-of-the-art 4D documentary movie at the Beit Hadassah museum of Hebron history. Kosher-for-Passover food, locally made arts and crafts and children's activities were on hand as well.